The Adventures of Tioga and George: Am I going? 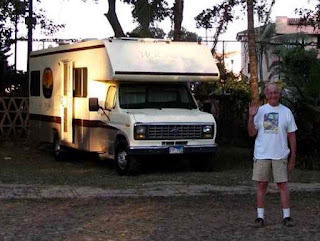 In yesterday's blog post, I raised the possibility of taking a trip to Bakersfield, California to visit the remains of MsTioga, my former RV. The purpose of this trip would be to retrieve the personal stuff that I left behind. About a week after my open heart surgery in March, 2014, I returned to the towing company that had possession of MsTioga. I was in no condition at that time, to go rummaging around in MsTioga's interior to try and locate my personal stuff. In fact, at that time, I could barely walk. The interior of MsTioga after the accident was complete chaos. Most of the upper cabinets had been torn from the walls, their contents strewn in jumbled heaps all over the floor. In order to search for things, I would have had to dig threw all this mess on my hands and knees. That was completely impossible in my post operation condition. That was how things were when I made the decision to sign over MsTioga's ownership to the towing company. With that ownership transfer, I was no longer responsible for the accumulating huge storage charges. In fact, in an extremely generous decision, the towing company absolved me of all the storage charges that had accumulated to the signing date! In late April, 2014, I moved into my Guava Gardens apartment in La Mesa, California. By that time, I was pretty much comfortable with not returning to MsTioga for my stuff. I had known friends who spent years in the attempt to deal with stuff accumulated over many years. With this "leave behind decision" that I made, I was relieved of all of that. I started off my new life fresh. But there were things that I pined for. Letters that I received from relatives and friends over my life time. The autograph book from my Bar Mitzvah. My bible, with dates of my family. My cookbook that I had for over 30 years. I have been leaving voice-mail messages for the person in charge of the towing company. So far, I've not received a response. I will keep trying. Today was a very good one for me. My right hand and arm hardly acted up at all. In fact, late this afternoon I felt good enough to go for a bike ride to "Original Mexican Gourmet" to get their carne asada tacos! Those were good years George, I enjoyed traveling with you - but we now are in our golden years Thanks for the travels and I look forward to reading about these golden years. Yes! You may be right. I will give your comment much weight in my decision whether to go, or not to go. In the end, George, it is all stuff but it was taken from you so abruptly; would be nice if you could discard it in the way you wish. Certain items you may want to keep if you can get at them and some you may just want to remember with good thoughts. We have been downsizing and I know first hand the struggles of deciding what to keep, what to discard but in the end it is still all stuff.